$2.49? $3.69? I have no idea how much the Classic Double with Cheese hamburger at Wendy's sells for. Do you know why? Simple; it isn't an item on their Super Value Menu and since that is the only part of their menu I ever look I have no idea what anything else sells for. The same goes for McDonald's. I know a buck buys me a McChicken sandwich or Double Cheeseburger off the value menu but I don't have a clue what a Big Mac or a Double Quarter Pounder with Cheese sells for. I'm a value guy and when it comes to golf I'm no different. Salt Lake City may very well be the value golf capital of the world. There are more solid golf courses for under $30 in the Salt Lake valley than any other area I'm aware of. From Valley View to Bountiful Ridge to the collection of courses at Wasatch State Park, the golfer on a tight budget has to love life near the Wasatch Front. However, occasionally the situation calls for something more than what the "value menu" has to offer and when the situation arises Thanksgiving Point needs to be on speed dial. The "Point", as locals refer to it, is an immaculate track that held back no expense when putting in the biggest and best public track in the state. 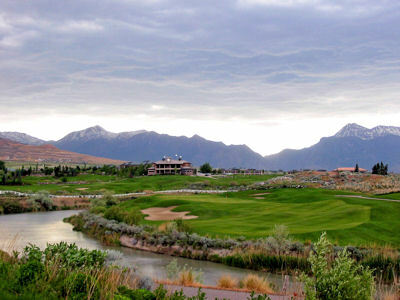 Covering more than 200 acres, Thanksgiving Point boasts 10,000 trees and numerous bushes and flowers that beautify the course and surroundings. Utah's Golf Hall of Fame calls the Point home where various items are on display in the stunning 22,000 square foot clubhouse. 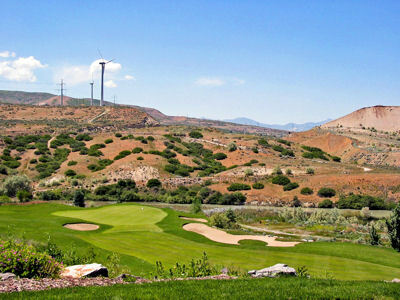 Ranked as the 5th best new upscale course in the country by Golf Digest after opening in 1997 and playing host to the annual Champions Challenge, Thanksgiving Point flaunts more accolades than any other public access course in the Beehive State. To say that the Johnny Miller Signature Course offers a challenge would be an understatement. Stretching out to over 7700 yards, the course features a stiff 76.2 rating and 140 slope. If you don't play at Johnny Miller's, or one of his sons, handicap you need not worry because there are five separate tee boxes in which to pick from; the shortest of which is a manageable 5838 yards. The prettiest feature on the course isn't the 55 acres of sand or the beautiful mountain backdrops, it is the way Johnny Miller utilized Mother Nature's contribution; the Jordan River. Factored into several holes throughout the course, the Jordan River is most superbly featured on Miller's impressive collection of par threes. The first one-shotter you'll encounter is the fourth hole of the day and virtually the only part of the golf course you can sneak a peak at when driving down I-15. Playing from an elevated tee, the player gets his first glimpse of the Jordan River as it snakes behind the large green of this nearly 200 yard long hole. Ample room to land your ball is afforded with the fairway fronting the green and additionally with the playing area left of the hole. Generally playing downwind, this is your easiest par three of the round. At this point in the round you should be plenty warmed up and ready to take on the Jordan River's stiffest challenge; the 208 yard 7th hole. Flowing down the entire left side of the hole, the Jordan River lays claim to hundreds of balls a week and instills fear into the heart of anyone who dares take aim at a back left pin location. The green is long and narrow so knowledge of the pin position depth becomes increasingly vital when considering what club to take off the tee. Four bunkers protect the hole and the clubhouse and mountain ranges stand as a backdrop to this picturesque par three. Listed as the 18th handicap on the scorecard, this hole is hardly the easiest on the day. Playing 218 yards uphill and generally into a stout wind, the 15th hole is a grinder. The hole calls for a left to right shaped shot that can stay over safe ground and then land softly on the green. Don't lose it too far right though because that side of the green drops off steeply to a deep bunker that acts as your last barrier before dropping to the Jordan River below. The green is deep and the strong winds can cause havoc off the tee so keep it left and safe and grind out a par. Like TPC Sawgrass, Shadow Creek, Sahalee, and other great courses, Thanksgiving Point reaches its climax at the 17th hole with a phenomenal par three. A big carry is needed off the tee to reach the hole that awaits 250 yards away on a huge peninsula green. It is too rare that a golfer gets to feel the type of exhilaration the beauty and challenge this hole offers as the Jordan River saunters around the back, left, and front of this multi-tiered and undulated putting surface. Take a deep breath, commit to your shot, and swing away because this is the type of hole great stories come from. 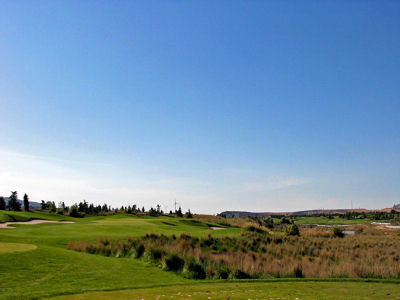 Thanksgiving Point is an absolute pleasure to play and as much of a challenge as any course in the surrounding area. While the green fees won't be found on the value menu, they certainly aren't budget breakers with twilight rates starting at $39 and prime weekend tee times running for $79. So the next time you are near Salt Lake make sure you treat yourself to a Classic Double with Cheese instead of a Jr. Bacon Cheeseburger and pick up a tee time at Thanksgiving Point; even a guy as cheap as I am can see the extra value at the Point. Want to see more photos of Thanksgiving Point? Click on the link to see photos of every hole at this stunning beautiful and masterfully designed golf course.